First up – they should have stuck with the original title, “Arms and The Dude” (much better) from the true-life Rolling Stone article it takes itself from. Second up – this is probably director Todd Phillips’ most accomplished movie to date. Even if it misses the mark at times. David Packouz (Teller) & Efraim Diveroli (Hill) were high school buddies reunited who, under the Bush administration, managed to make millions selling arms to the US military to arm Afghan forces against Iraq. Yes, it happened. 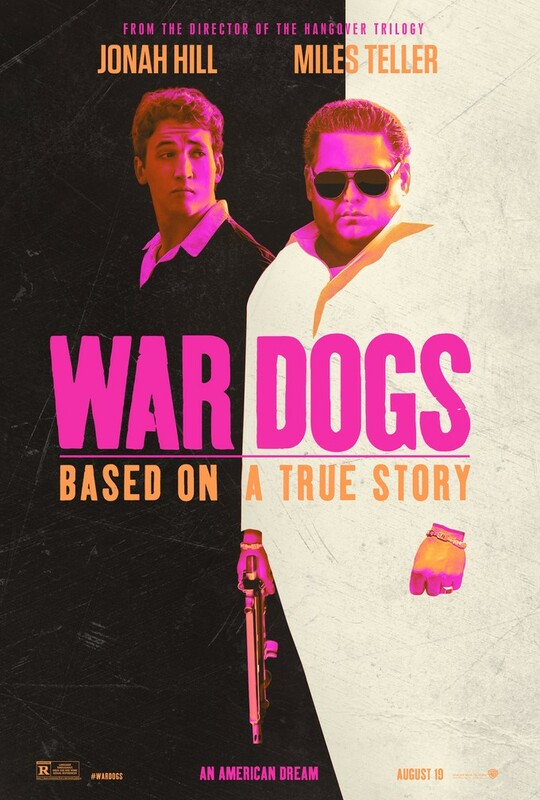 And, at its best, War Dogs manages to explain how it happened, how war is more an economy than a moral battle. There’s no doubt that this is a fascinating story and to his credit, Phillips has cast very well. Hill just gets better, especially the more he veers away from bong-tastic comedy, whilst Teller (whose face appears to become more scarred with every movie) makes a very decent job of the movie’s reliant voice over, as well as providing its audience’s anchor point. War Dogs initially seems to be going with a satirical viewpoint, but ultimately chooses more to document than comment on the events depicted. Maybe Phillips was seduced by the quality of his two lead performances, but at times, as winning as the film is, it feel like this dog’s bark is all there is. Some more bite would’ve been nice.